Near the end of World Without Jews (Yale University Press, 2014), we find this passage from a letter written in June of 1943 by a Wehrmacht officer named Wilm Hosenfeld, a Catholic, a schoolteacher in civilian life who had come to know a lot about the fate of the Jews deported from the Warsaw Ghetto: “With this terrible mass murder of the Jews we have lost the war. We have brought upon ourselves an indelible disgrace, a curse that can never be lifted. We deserve no mercy, we are all guilty.” Hosenfeld was later captured by the Soviets and died in a Siberian gulag. The remarkable thing about this letter is not just that it was written, but that its author was a member of the notorious Sturmabteilung who later became a full member of the Nazi party. One may ask: doesn’t the fact that one Nazi could feel this way repudiate the “we had no choice – we were following orders” excuse so often heard from other Holocaust perpetrators? Confino notes that the burning of the Bible was a Nazi obsession: thousands and thousands of Bibles were heaped on the flames, culminating in the great fires of Kristallnacht, during which not only Bibles, but 1,400 synagogues were set on fire. 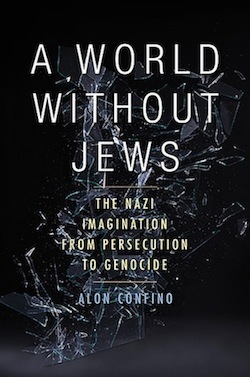 Confino’s goal in World Without Jews is precisely to explore the very backgrounds and influences that created a uniquely genocidal culture. He begins his quest at a new starting point by asking, if Nazi policies were fueled by master-class racism, why were the Nazis so anxious to prioritize the burning of the Bible? Confino notes that the burning of the Bible was a Nazi obsession: thousands and thousands of Bibles were heaped on the flames, culminating in the great fires of Kristallnacht, during which not only Bibles, but 1,400 synagogues were set on fire. Confino’s subject, then, is not Auschwitz, as it is of many Holocaust historians. Rather, it is this: how could Germans imagine a world without Jews? Where could such an absurd, fantastic notion come from? How could it become legitimized? How could it possibly be carried out? Confino is certain of one thing: the Judeocide was fully anticipated before it began in 1941. This conviction contradicts that of most Holocaust historians, who feel that the Holocaust was an ex tempore “solution” to the “Jewish Problem” raised by the German forces’ occupation of Eastern Europe. Not so, says Confino, because the Holocaust was a result of “an accumulation of ancient [largely Christian] hatreds” fueled by 19th-century nation-building and given precedent by the mass murders perpetrated around the world in the 19th century by British, French, Dutch and Belgian colonizers. But why Jews? Why was their extermination seen as so central to German survival? Confino’s answer to this question is that Jewish culture had always been a culture of chaim, of life; the Nazis wanted to found a culture of death. To do so, they had to “eliminate the shackles of a past tradition” to “liberate their imagination to open up new emotional, historical and moral horizons that enable them to imagine and to create their empire of death.” Thus, life-centred Jews had to go, and their books with them. On the question of who knew what was happening, Confino is uncompromising: no one in Germany could not have known – not necessarily about the mass murders, but that “something terrible” was happening. In Confino’s view, the extermination of the Jews was fully intentional; all it required was a passive populace, and the active participation of the Christian Church. The Nazis got both, in spades. Confino doesn’t hesitate to directly implicate the Christian Church in the Nazis’ program to eradicate Christianity’s Jewish origins: time and again he reasserts the “fundamental affinity” between Nazism and Christianity regarding the need to eliminate Christianity’s “Jewish roots.” The difference between them was that for the Nazis, they produced Christ; for the Church, it was because they killed him. One of the most unforgettable and heretofore never published photos contained in World Without Jews, shows a small statue of a crucified Christ in front of a church in Westphalia. Under the statue, in large letters, there is the sign “No Jews Allowed.” Just over the head of the Christ are the letters “INRI”: that is, in Latin, “Jesus of Nazareth, King of the Jews.” May this irony not be lost and, to that end, may we be thankful for books such as Confino’s World Without Jews. Graham Forst, PhD, taught literature and philosophy at Capilano University until his retirement and now teaches in the continuing education departments at Simon Fraser University, University of British Columbia and Banff School of Fine Arts. From 1975 to 2010, he co-chaired the symposium committee of the Vancouver Holocaust Education Centre.